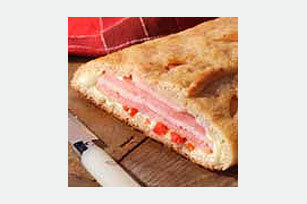 Fill refrigerated pizza crust with ham, turkey, cheese and peppers for this Easy Stromboli recipe. Serve this Easy Stromboli with a mixed green salad. Unroll pizza crust on baking sheet sprayed with cooking spray. Pat out dough to 15x10-inch rectangle; sprinkle with Parmesan. Layer remaining ingredients lengthwise down center of dough. Fold dough in half over filling; pinch edges together tightly to seal. Cut small slits in top of dough to vent. Bake 15 to 18 min. or until golden brown. Cool slightly before cutting to serve. Serve this easy-to-make stromboli with a mixed green salad and fruit cup for dessert. Add 1/4 cup each chopped onions and tomatoes to the filling, then sprinkle with 1/4 tsp. dried basil leaves before covering with dough.